AUSTIN, Texas — Less than one week after Beto O'Rourke announced he is running for president in 2020, an artist took his skills to the next level to show support for the El Paso Democrat. Stan Herd is best knows as an "earth artist" and is based out of Lawrence, Kansas. "It's kind of bringing community into an art effort, and that's the artist's dream," said Stan Herd, who took about two weeks to put the artwork together. "The first thing I do is find a canvas," said Herd, who flew into Austin searching for a place to put the artwork. Most of the material to put the piece together were found on site. His medium used is typically elements like gravel, sand, mulch, and rock to add color and texture. "We try to get close to an airport to guarantee a closer audience," he said. Herd has been painting portraits with organic materials for more than 40 years. "Pecans are a big product in Texas," he said while pointing out a portion of O'Rourke's eyes. "It's a nice brown color." The massive artwork of the presidential candidate takes up almost two football fields and is about 1.5 miles north of the Austin-Bergstrom International Airport. "We're trying to tell the story of this amazing man from Texas making a difference in the national climate," Herd said. The project took nearly two weeks to sketch, put together and finish. 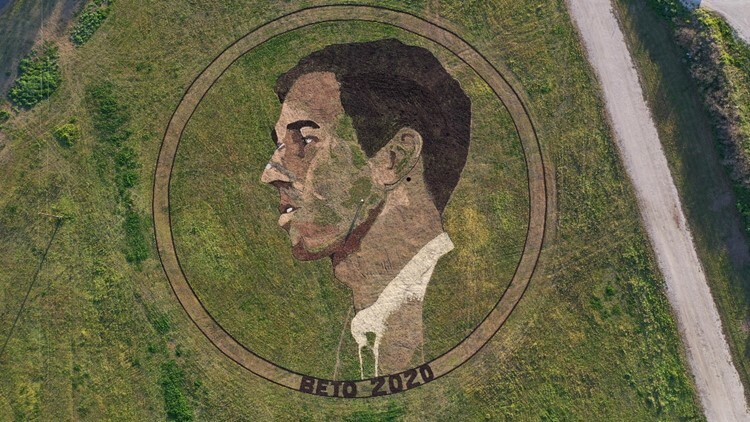 "Herd was in the field for hours a day," said John Zarr, who was the project manager and assistant to putting the O'Rourke portrait together. Herd would outline everything on the ground, and the last step was putting in detail. "Why not let your voice be heard," said Zarr. "Part of the beauty in this is that everyone contributing feels like they are part of something larger than any one person or institution." With more than $10,000 spent on the artwork, the duo hopes to be a part of a much greater national conversation. "Everyone is trying to decide where we go as a nation," Herd said. The artwork was placed on a piece of land at Carson Creek Ranch. It's easily visible to anyone arriving or departing from ABIA, and will be visible for about seven days. Herd has been dubbed the "Father of Crop Art" and has created dozens of pieces of art all around the world.